I was all ready to make my homemade cleaners for the month and I realized I was out of washing soda. I drove out to Wal-Mart (where I usually am lucky enough to find it) and the shelves were empty where the washing soda usually sits. I went back the next week and they were still out. I tracked down a friendly Wal-Mart associate and he informed me that they would no longer be carrying the washing soda, but hey, they had plenty of baking soda. Does he realize these two things are not the same? To say I was discouraged would be putting it mildly. As a last resort, I checked out this little podunk hardware store near my house. She told me that they didn’t have any, but she remembers her nephew making some as part of a science project for school. She couldn’t remember the details, but she was pretty sure it was just heated up baking soda. It can’t be that easy. They aren’t the same thing, remember? So how do you know when it’s done converting? Just use your eyes. It’s subtle, but you can tell the difference. Baking soda is fine and powdery. It also appears a bit shiny. Washing soda is dull and grainy. 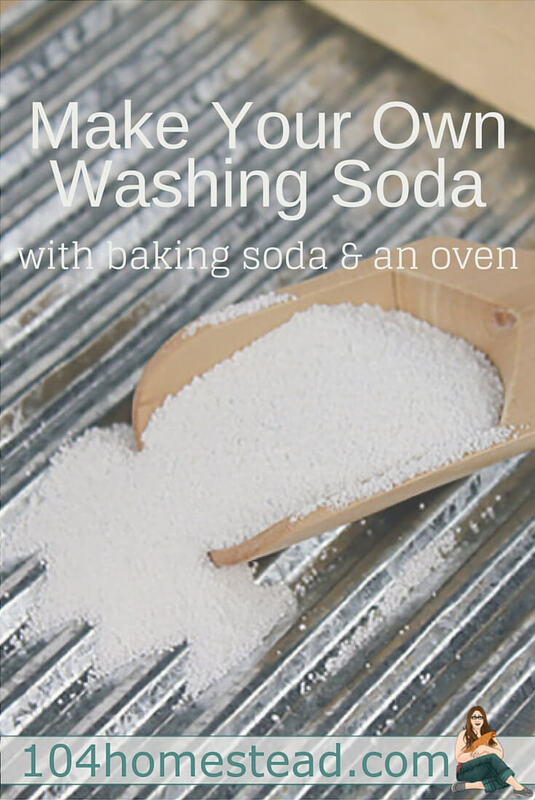 When you’re done making washing soda, you can use any of your leftover baking soda to clean your stove top and oven. For those of you who care about the chemistry, this is for you. For the rest of you, feel free to scroll down and pin the image below to save for later or share with your friends. When baking soda (sodium bicarbonate) gets heated, it turns into washing soda (sodium carbonate) + Carbon Dioxide + Water. In addition to using this as a cleaning ingredient, you could use it as a fun homeschooling science project. Science rocks! For more fun activities for your kiddos, check out these fun activities that will pull them away from the TV. What is washing soda used for? 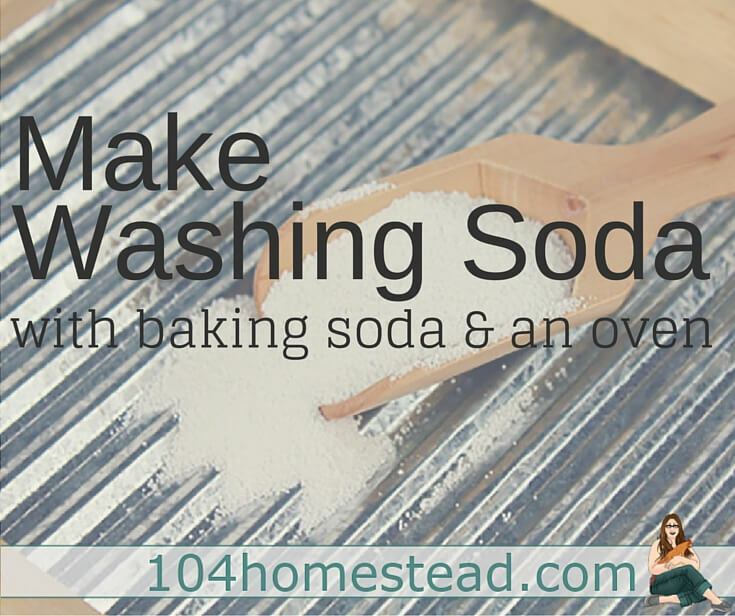 Also known as soda ash or soda crystals, it’s a solvent used for removing stains. As the name suggests, it’s most commonly used for washing laundry. That’s not the only use. Here are a few other ideas. Prairie Homestead has a cheap and easy liquid dish soap recipe that I’ve fallen for. We use the dishwasher for most of our dishes, but if I forget to run it, I’m stuck hand washing. This works up really fast and only costs pennies. Root Simple shows you how to scour cotton for dyeing by soaking it with washing soda. One Good Thing by Jillee has 39 other uses for washing soda in case you still need ideas. I will make washing soda according to your tips .thanks for sharing,and keep sharing. Great article! I didn’t realize washing soda was so easy to make. Much more expensive to buy, so I’ll be making my own from now on! I’m so glad to help Esther! I do not know who you’re however certainly you’re going to a famous blogger in case you are not already.